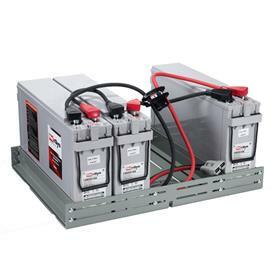 EnerSys and Toyota Material Handling, USA (TMHU) have announced that EnerSys battery and charger solutions for materials handling applications are now available in the STARLIFT Parts Program. The STARLIFT Parts Program serves as a one-stop-shop of parts for all makes of forklifts, sweepers, scrubbers, personnel carriers, aerial work platforms, tow tractors and other materials handling equipment. Available at Toyota forklift dealerships throughout North America, STARLIFT’s non-Toyota Genuine parts are sourced from the nation’s leading industrial equipment parts suppliers and consistently meet or exceed industry standards. "At EnerSys, we’ve been supporting TMHU and the TMHU dealer network with products that exceed industry standards for many years, so our battery and chargers are a perfect fit for the STARLIFT Parts Program," says Chad Uplinger, vice president - motive power Americas, EnerSys. "Along with providing TMHU end-users easy access to our products, our participation in the STARLIFT program represents a key first step toward the development of more collaborative power solutions with TMHU." "TMHU and EnerSys share several core values and attributes, including premium products, a reputation for quality and the industry’s best coverage," says Bret Bruin, TMHU director of aftermarket operations. "The addition of EnerSys aligns with TMHU’s vision and goals to provide the dealer network with a complete product offering of quality STARLIFT products. Moving forward, we hope to work with EnerSys even more closely on integrated battery and charger technologies." To help support its product launch for the STARLIFT program, EnerSys recently attended TMHU’s national parts, service, and CSS managers’ meeting in Orlando, Florida, where the company showcased its products to approximately 300 attendees at the STARLIFT Vendor show and led a breakout session to train and educate on products and available sales tools.